[By Nick] With all of the free Chocolate Shoppe base flavor samples out of the way, it’s time to take a look at couple of mix-in included flavors, specifically nut mix-ins. 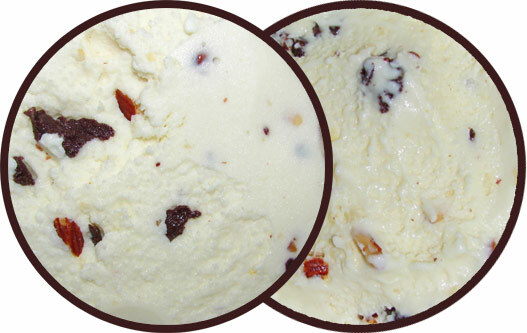 One of which I know I’ll enjoy, Butter Pecan, and one I’m not so sure about, Coconut Almond Bliss. Since I’m a believer in saving what might be the best for last, let’s start with the latter. It’s well documented that I’m not a fan of coconut. However, it has started to grow on me a little from my exposure to So Delicious’ Coconut Milk ice cream. I can’t help but be intrigued yet hesitant. On one hand, I love almonds and I’m curious about what exactly liquid chocolate chips are. On the other hand though, for some reason the term tropical coconut makes me think of sun tan lotion which is the worst possible outcome with coconut products. Eh, let’s get this over with. Yep, pure coconut is still not my thing. While the base alone is tolerable and actually borderline enjoyable for me, it’s the flakes of coconut flesh that tests my coconut tolerance. They aren’t all that prevalent but when you run into some, the coconut flavor really hits you. I can see anyone who remotely enjoys coconut enjoying this one though. Before we move onto the mix-ins, let’s talk about the ice cream’s texture for a moment. It’s very chewy for lack of a better term. Now that I think about it, it reminds me of the experience I had with Sorano Gelato. It’s strange yet enjoyable to be honest. The almonds shockingly taste like almonds. There’s really not much else to say about them other than they are quite abundant and add a nice crunch. The real star is the liquid chocolate chips. They vary in greatly size, like Graeter’s, but instead of being rock hard chocolate, they have the texture of hardened magic shell. I actually wouldn’t be surprised if the process in which they make them is quite similar to pouring magic shell and breaking it up. The chocolate’s flavor is pretty average but I have no complaint with it. They’re just fun and make for an awesome mix-in. Off the top of my head I know they’re involved in at least another one of the flavors Chocolate Shoppe sent me. I can’t wait to give the swirl a try when it's in a more Nick-friendly base. loads of crispy, lightly roasted and salted pecans.” I do like my servings of pecans to be by the boat-load so let’s dive right into this one. Hmm, where’s my boat-load of pecans? There they are! Sampling the base alone, there’s a difference in texture from Coconut Almond Bliss. This one doesn’t have that chewy texture but is more on par with other super premium ice creams. I feel that the change was a smart move with a more traditional flavor like Butter Pecan. Taste wise, this might just dethrone Haagen-Dazs Butter Pecan as my favorite. 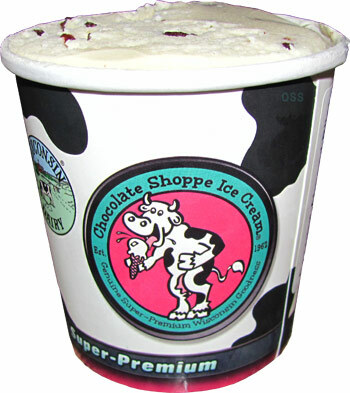 While not as buttery, Chocolate Shoppe’s base has the right ratio of butter to sweet notes. Neither overpowers the other, instead they are working in perfect harmony. This is the kind of flavor that’s simple yet completely satisfying. 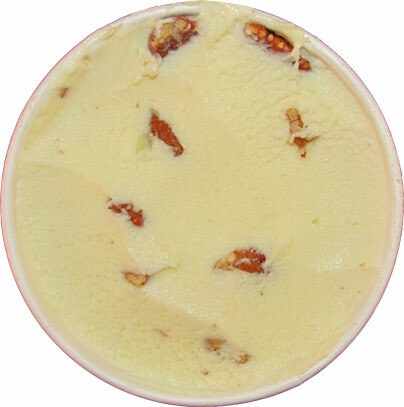 The base alone is enough to remind me why butter pecan is my go-to comfort flavor but the pecans are nothing short of extraordinary. They range from full pecans to quarters and are overly abundant. Chocolate Shoppe’s description is spot on; they are indeed crispy with just the right amount of salt. However they fail to mention how buttery they are. With the base not being overly buttery, they make for the perfect addition. The sweetness of the base works to tame the pecan's butter flavor while the pecans work to amplify the buttery aspect of the base. I’m not even sure if that last sentence made any sense but all of that doesn’t matter. Just trust me when I say this is the best butter pecan I have ever tried and you should get yourself a pint or a scoop if you have access to it! I’m sorry Haagen-Dazs but I think it’s time for me to move on. As someone who enjoys coconut, Chocolate Shoppe's Coconut Almond Bliss is my absolute favorite.